Imagine being diagnosed with cancer, a genetic disease, or even age-related deterioration in the morning, given a single injection in the evening, and beginning your recovery the next day. No prescriptions, no lengthy treatments, no difficult decisions between finances and getting better. This is the promise of gene therapy, a promise already being fulfilled. 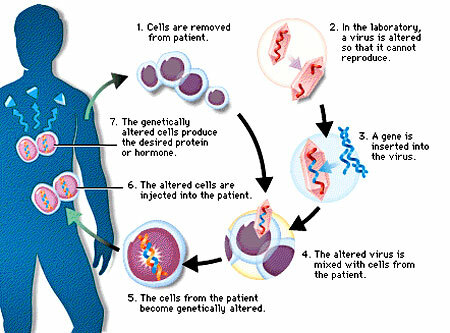 One method of gene therapy - taking human cells, "editing" them genetically, and reinserting them into the human body where they will replicate and carry out their newly designed functions. Gene therapy is the identifying of faulty genes, be they inherent or mutations in the form of cancer or aging, and designing a vector to replace the faulty genes with fully functional, repaired versions of your genetic code. Once introduced, the corrected genes replicate themselves, displacing aged, mutated, or faulty versions. The technology is a double edged sword however - and can be used to harm just as well as help - in very profound ways. Public awareness and engagement in the emerging field of genetics is an absolute necessity to ensure this technology is used for good rather than profit, or worse yet, increasing death and disparity. The proliferation of ballistic and cruise missiles and long-range unmanned aerial vehicles (UAVs) will make it much easier to project military power around the globe. Munitions themselves will become increasingly accurate, while new methods of attack - electronic, “non-lethal,” biological - will be more widely available. Although it may take several decade for the process of transformation to unfold, in time, the art of warfare on air, land, and sea will be vastly different than it is today, and “combat” likely will take place in new dimensions: in space, “cyber-space,” and perhaps the world of microbes. Further, the process of transformation, even if it brings revolutionary change, is likely to be a long one, absent some catastrophic and catalyzing event - like a new Pearl Harbor. Exactly one year later, the US would "serendipitously" experience "a new Pearl Harbor," described as such by the very signatories of this report. This "catastrophic and catalyzing," not to mention convenient, event was the September 11, 2001 attacks on the World Trade Center in New York City and the Pentagon in Washington D.C. The "transformations" described by the 2000 PNAC document would then unfold in quick succession, including elements described under "cyber-space" warfare now demonstrably unfolding against nations like Iran. Likewise, ideological partners of PNAC at the American Enterprise Institute (AEI), namely Jon Entine, constitute modern day Nazi eugenicists, who have literally penned articles advocating a renaissance of the disgraced inherently racist pseudo-scientific discipline while laying the groundwork for legitimizing genospecific policies - including in warfare. When it is time to present genospecific weapons to the public, it will be those like Entine at the AEI crafting the talking points. Entine is also a tireless supporter of genetically modified organisms (GMO), more specifically the poisoned, dangerous products of big-agri giants like Monsanto and Syngenta. His website, the "Genetic Literacy Project" is a shameless clearing house for big-agri lobbying efforts - funded by big-agri. His ties to corporate-subsidized academia and corporate special interests indicates that his intentions to abuse this technology are not merely the rants of a single man, but an institutionalized agenda he serves as a spokesman for. People like Entine thrive because of the vast and profound public ignorance surrounding genetics in general as well as topics including genetic engineering, gene therapy, and the threats and opportunities each represents. A real genetic literacy project, run by local DIYbio community labs (video), with hands-on projects and workshops, would go a long way in combating big-agri's reality skewing "Genetic Literacy Project". Tying these local groups with nearby institutions not only helps keep those on an institutional level honest, but also working in the best interests of the majority, with communities supporting them. When lies are told by the likes of Entine and other paid-for faux-academics, a well armed population will be immediately aware of it. With a network of increasingly better equipped community labs, people will have the means of holding accountable corporate-giants, and combating their encroachments upon their communities in terms of agriculture and health care. In the light of truth, people like Entine and those he represents cannot operate with the impunity they now enjoy. Glybera - the first Western-approved gene therapy may treat a rare genetic disorder affecting the pancreas for an entire lifetime with a single treatment. One doesn't need to stretch their imagination far to imagine the consequences this will have on big-pharma profiteering, nor the measures they will take to protect their interests. Ultimately, such treatments belong in the people's hands - not special interests and the governments that serve them. Another threat exists, coupled with the very promise of gene therapy. In November of 2012, the first gene therapy to get Western approval made news. Called Glybera, developed by Amsterdam-based UniQure, it treats a rare genetic condition that effects the pancreas. 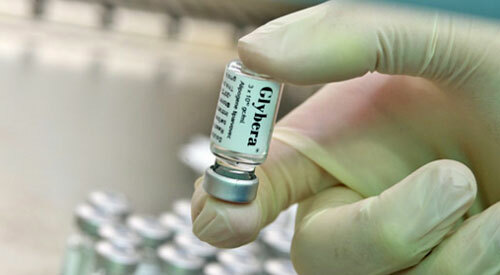 Glybera may be effective over the course of an entire lifetime, meaning it is a one-time treatment. "how do you price a one-off treatment?" In reality, disease is like a war. A nation would not "price" the survival of their nation in the face of a looming enemy, nor should they "price" the survival of their population in the face of disease. Of all the things a nation should throw public money at, an institution of health producing permanent cures for disease and age related deterioration should be at the top of the list. Unsustainable national health care schemes consuming billions of dollars a year, in need of rationing care, as well as compromising on quality, would be transformed by such an initiative. Special interests would be the only ones to lose out, and because special interests currently drive human destiny, this is precisely why such a transformation is not on the drawing board, or part of public discourse. Again, public ignorance provides the shadows within which this racket is allowed to continue. While Glybera is the first gene therapy to be approved, treating a very rare genetic condition, many other treatments are being tested - including cures for hemophilia and even blood cancers. Such revolutionary work should be at the center of public health news and debate - as well as how to direct more resources into this research considering the profound long-term benefits it will have on every single member of society. Expanding the human resources necessary to research and develop a new health care paradigm should also be at the center of public health debate. Instead, policy issues such as health insurance, government subsidies, and rationing are the political footballs of choice used to distract the public from real paradigm-shifting issues. Such policies not only preserve the current Big-Pharma profiteering rackets, but help expand them in stride with financial frauds across the multinational insurance "industry." The answer is not to wait for politicians and the corporate-media to address these topics and hold the discourse required - as both are partnered with the very corporate-financier interests perpetuating this false paradigm. Instead, the people must take matters into their own hands, decentralizing both the debate on health care as well as tackling health care issues themselves. The first step is educating ourselves and the public of both the promises and the current realities of the expanding field of genetics and bioengineering. With a table, a sink, and basic kitchen equipment, local groups already meeting in the context of hackerspaces or makerspaces, can begin exploring and educating others about biology and genetics. Inviting professionals in to oversee more complex experiments, classes, and demonstrations, as well as manage safety and provide educational opportunities for the public can be a next step. Many university competitions involve bioengineering. Teams require a space to meet and conduct research, to design and test experiments. A community initiative to provide students with a permanent place to do this can lead to a community lab - opening the door to a larger collective community of DIYbio enthusiasts. Genspace is a community lab located in New York City. It provides a model for other communities to follow - one that is both responsible and holds immense implications as people begin to engage at a grassroots level in driving science and technology. While many worry about such technology in the hands of ordinary people, DIYbio will most likely take the form of the Internet - where trouble makers are vastly outnumbered, and their disruptions easily managed by an increasingly informed and capable tech community. Just as 3D printers and other forms of increasingly affordable and capable manufacturing equipment are finding their way into local spaces created by various community initiatives, biomedical technology will likewise become more affordable and easier to use by a greater number of people. It is important to have the local human resources and infrastructure to support leveraging this technology for the best interests of the people - not only institutions and corporations. Educating ourselves, others, as well as creating a community space for developing and deploying biotechnology may seem like a small step to take. But communities across America, and around the world doing this in parallel will have a profound impact on both the health care debate, as well as health care itself. It will encourage a well informed air of transparency around this currently misunderstood and monopolized discipline. Large pharmaceutical corporations and even IT corporations like IBM and Google seeking to skew the course of public health care, will no longer be able to hide in the shadows of public ignorance and perpetuate an unsustainable, inhumane, profiteering approach to human health care. Everyone deserves the absolute best health care possible - and that can only be done through technological innovation built upon a solid foundation of education within a well informed, productive and engaged society. Current policy seems designed to accomplish the exact opposite, to leave society ignorant, blind, and at the whims of an increasingly unstable ruling elite. There is an army of people like Jon Entine, bent in service to special interests who have documented their intent on monopolizing and abusing bioengineering as a means of profit and literally as a weapon of war. Unlike bullets, genospecific weapons have the capability of permanently and profoundly changing the very nature of what it means to be human. Gradually, by selective breeding, the congenital differences between rulers and ruled will increase until they become almost different species. A revolt of the plebs would become as unthinkable as an organized insurrection of sheep against the practice of eating mutton. In Russell's time, genetic engineering - instant selective breeding - was not a possibility, but what Russell's quote indicates is that the motivation exists amongst the ruling elite to achieve such disparity. Now they have the tools to achieve it within a single lifetime. We have the ability to break this monopoly, and replace disparity with a full spectrum balance of power by localizing civilization's infrastructure from the mundane, to the cutting edge of technology.